A Friday night in Deep Ellum means that you can find music on almost every street corner. Tonight I found myself at Wit’s End for the Giant of the Mountain and Canyon of the Skull tour kickoff. The bill was rounded out by Mouth Breather, In Oblivion, and Gruesome Fate. With 3 of the 5 five bands being from out of town, as well as multiple other concerts going on at different venues on the strip, the start of the show brought concerns of a decent turnout. Mouth Breather @ Wit’s End, Dallas,TX. Photo by Corey Smith. The concert kicked off at 9:00PM with Mouth Breather who is based out of Wichita Falls, TX. Though being approximately two hours from the Dallas area, Mouth Breather isn’t a stranger to the Dallas metal scene. As the music kicked off, I was one of only a few people in the venue that wasn’t either in a band playing or part of the venues’ staff. This didn’t deter the three piece from giving it their all on stage from the first chord to the last. Vocalist and guitarist Ryan Hager belted out clean, yet almost grunge-like vocals, while bassist Aaron Epp and drummer Kevin Peters completed the line-up as the rhythm section. A small crowd trickled in as the band delivered simplistic, bare-bones sludge the way it should be delivered. The addition of vocals that were almost atmospheric was a welcomed relief to the sludge sound. For me, this made the music memorable and I hope the band continues to expand their sound while maintaining their simplistic song structure. In Oblivion @ Wit’s End, Dallas,TX. Photo by Corey Smith. Up next was In Oblivion from Austin, TX. The band is made up of what some would say is an all-star cast from the Austin metal scene. 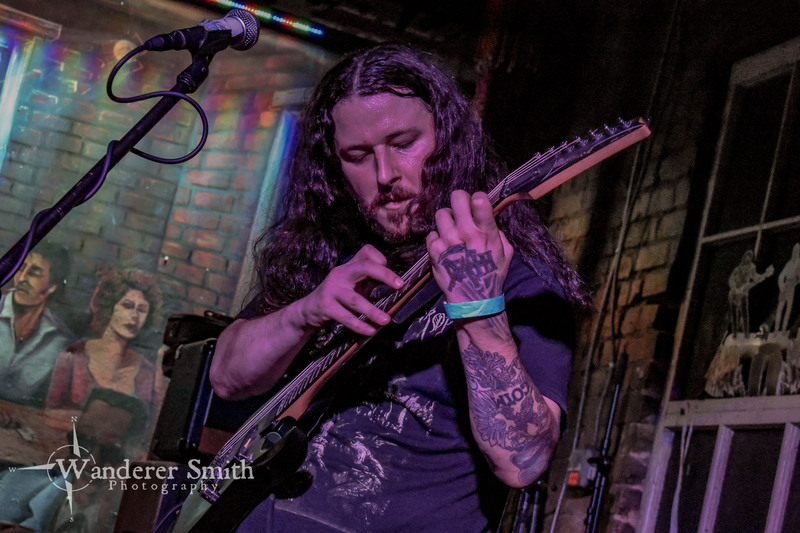 Justin Buller (guitars and vocals), Ciaran McCloskey (guitars), Jake Holmes (bass), Ryoko Minowa (keys), and Adrian Voorhies (drums) brought an atmospheric doom production to the small, yet intrigued crowd. The band hasn’t performed live in almost 2 years, but you wouldn’t have known. Executing timing on doom tracks is something I will always admire and this group delivered with ease. The 30-ish minute set consisted of two songs. Yes, two songs. The set opened with the atmospheric keys of Wreathed in Gloom and then continued with heavy riffs, deep vocals and crushing drums. I couldn’t help but let it take my mind back to seeing Mournful Congregation a few years ago in Olympia, Washington. This time though, the music was constructed by a group of Texans who suffer from the ever climbing heat of the summers. The band closed the set strong with Memories Engraved in Stone. Atmospheric doom is my favorite and I’m glad to know that these Texas natives are up to the challenge. I hope it’s not another two years before we see In Oblivion live again. Canyon of the Skull @ Wit’s End, Dallas,TX. Photo by Corey Smith. Next we were graced with the presence of Canyon of the Skull. The first two piece of the night was lead by Erik Ogershok (guitars). Erik is also the brewmaster at Warpigs Brewing in Chicago and a former Texas resident. Erik brought Adrian Voorhies (drums, who also performed with In Oblivion) on board to complete the Canyon of the Skull lineup when he previously resided in Austin. Erik and Adrian delivered a passionate 30 minute set of instrumental doom. With riffs repeating until you can’t get them out of your head, to awe inspiring drum fills that are almost jazz like, Canyon of the Skull stayed true to themselves throughout the set. Continuing in traditional doom fashion, the set consisted of only two songs, “Canyon of the Skull” and “The Ghost Dance.” The small crowd was put into a trance by the relationship between precision drumming and the riffs. Canyon of the Skull continually keeps you guessing as to what will be next. Giant of the Mountain @ Wit’s End, Dallas,TX. Photo by Corey Smith. Next up was a local favorite of mine, Giant of the Mountain. Cody Daniels (guitars, vocals) and Randi Matejowsky (drums) are two of the most talented individuals in the scene today. Mixing black, doom, progressive, and sludge, the duo extract the best parts of each genre to create a sound all their own. For this tour they are supporting their new album, Nature’s Wrath, that was released on 6/16/18. From melodic power-chords, to solos that I can’t even wrap my mind around, Giant of the Mountain instantly drew the crowd to the front of the stage to witness a musical clinic. Randi exceeded the fan’s expectations as she seamlessly transitioned from jazz grooves, to blast beats, to down beats that were all blended together with thunderous fills. The band performed songs exclusively from their new album as the crowd continued to grow larger with each song. Cody didn’t miss a note as he delivered a vocal range of both harsh and clean vocals that I’ve never heard before. It’s the kind of music that you can listen to on repeat and hear something new each time. Go to this tour and purchase the new album, you won’t be disappointed! Gruesome Fate @ Wit’s End, Dallas,TX. Photo by Corey Smith. To close out the night, Gruesome Fate entertained the crowd with their version of traditional death metal. The midrange guitar tone replaced what would be recognizable guitar riffs with indistinguishable white noise. This allowed for the drums to pump through the PA and let the handful of death metal fans that remained to slam dance the night away. Gruesome Fate showed that no matter the time, no matter the mix of genres on a bill, death metal fans, as well as the bands that they follow, will always support one another.